"Outside were stray animals and people, each about some pursuit. Sometimes it was a beggar at the door, sometimes a leprous hand reaching for a handout with a plea for compassion. Life with all its hurts and pains squinted at you, squatted before you, and stared you down daily. This was the street where I grew up." Ravi Zacharias has lived an extraordinary life. He has walked with great leaders, slept in the villages and homes of the poor, and crossed continents to bring the good news of the gospel to the world. Already a man of two worlds by the time he was twenty, Ravi never dreamed that God would lead him from his birth home in India to Canada and the United States, and eventually to a platform on the world stage. For thirty-three years he has spoken all over the world. He has addressed writers of the peace accord in South Africa, the president's cabinet and parliament in Peru, and military officers at the Lenin Military Academy and the Center for Geopolitical Strategy in Moscow. He has given the keynote address at the National Day of Prayer in Washington, DC, and has spoken twice at the Annual Prayer Breakfast at the United Nations in New York. 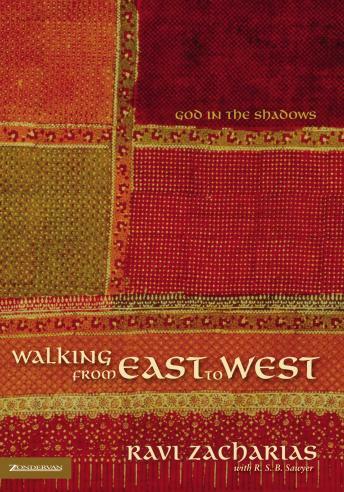 Walking from East to West is Ravi's life story, a deeply personal journey into his past. Dr. Zacharias invites you back to the southern India of his early childhood, and into his troubled youth in the sophisticated capital city of Delhi. He recalls the importance of a mother's love and his difficult relationship with his father. He tells about his long search for truth in wrestling with Eastern thought and the newer ideas of Christianity, the cry for help in a dark moment when he tried to take his own life-and the dramatic turning point that led to a life lived for Christ. Zacharias recalls his early days as a new convert, what it was like to find a new life in the Western world, and the eventual birth and growth of a worldwide ministry. This is a story about an amazing man. Yet it is also everyone's story about belief-how it begins, how it grows, and the struggles associated with it. Walking from East to West is a heartfelt personal story of one man's discovery that God is the author of our destinies, no matter how dark the shadows that hide the light. Zacharias' book will either be life-changing or life-affirming for the reader lucky enough to stumble across this amazing account of a life that saw so much pain and joy. To go along on his journey, watching him go from his desperate youth and into his successful and meaningful adult life is incredible. As someone who has been immersed in a Christian lifestyle her entire life, I find it remarkable that someone can come from such beginnings and end up the man that Ravi Zacharias has become. It really makes me think about how much of the Western experience I take for granted. Ravi is not only passionate about his faith, but he provides an intellectual basis for it as well, something that is often missing in evangelism today. The blend of Eastern and Western cultures presented in this book are extremely significant and helpful. This has caused me to take a new approach to different cultures and unbelievers. He is a living example of walking in someone else's shoes. I could say countless things to praise his life's work, but it seems to me that Zacharias would want any glory to be given to God. After hearing this, that is how I want the things I do to be remembered...for the glory of God. I cannot wait to read more from this talented evangelist! Don't listen to this book if you are driving on a long commute. You'll be asleep behind the wheel in five minutes or less. Really like the book and very encouraging. I’ve been listening to Ravi’s preaching for sometime now. Love it! Wonderful book! Ravi's life ought to be an inspiration and call to authentic Christianity to all of its readers. The noteworthy story of a man who is having a significant impact on current apologetics. The narration is appropriately warm for an autobiography and read at a good pace.